Mike and Becky purchased this home situated on 2 acres from the Flewellens in May 2004. Dr. Bill Flewellen had been the Dean of the College of Business at UGA and also a Master Gardener. He continually amended the soil with poultry litter, creating a rich foundation for growing a wide variety of trees, shrubs, and other plants. The Cavans have planted Blue Rug Junipers (Juniperus horizontalis ‘Wiltonii’) on the bank in front of the house. A flowering quince (Chaenomeles japonica ‘Toyo-Nishiki’) graces the foot of the driveway. A stately cherry tree (Prunus serrulata ‘Kwanzan’) with under-plantings of hellebores, autumn ferns, and aspidistra, stands at the top of the driveway. This area is filled with azaleas (Rhododendron sp. ), sweetshrub (Calycanthus sp. ), gardenia, peony, indigofera, daphne and forsythia. The iron gate supports a ‘ Peggy Martin’ rose, a Hurricane Katrina survivor purchased by Becky through Southern Living Magazine. Sales proceeds went to the victims of the hurricane. Beyond the gate, pathways and occasional stone steps lead to three flower beds, each containing bulbs, shrubs, Japanese maples, and native trees. UGA memorabilia, and yard art created by Becky add interest throughout the garden. In 2004, many pine trees were cleared to provide sun for the raised bed vegetable garden complete with a potting shed and a plant hospital. Boxwood topiaries, which Becky shapes, flank the rustic door into the garden. 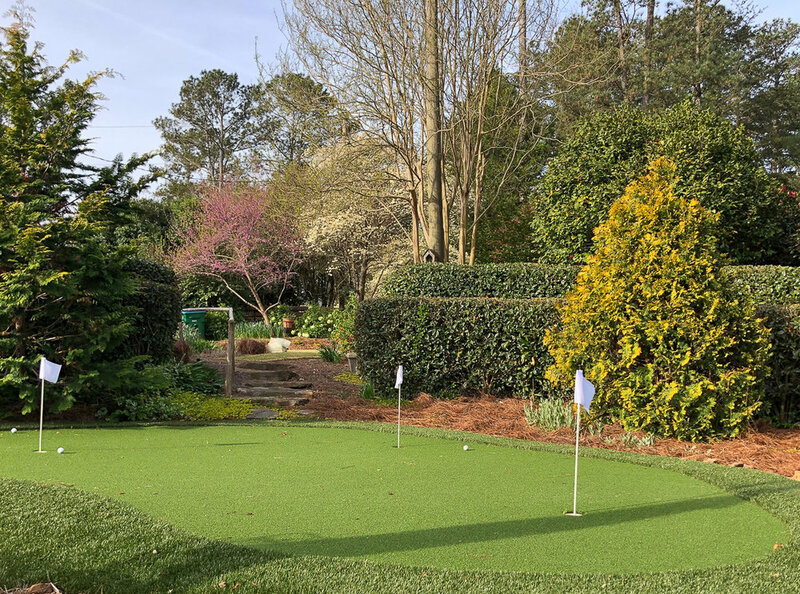 The path from the potting shed leads to a putting green. As the visitor exits through the gate into the front garden, there is another large planted area that includes Kousa Dogwood (Cornus kousa) and Deodar Cedar (Cedrus deodara).